We had a short winter this year! Well, we hardly experienced winter this year…it went by so smoothly and we did not even use our warm winter clothing. Summer is here and it is really quite hot. So it is time we start with cooling foods, salads, cool drinks & the ultimate …ICE CREAM!! We indulge in ice cream throughout the year but summertime means more is less! In my home ice cream is always welcome; more the merrier. My hubby’s all time favorite is Chocolate Ice cream and I love Custard Apple Ice cream. It is a feast for the eyes to see luscious, large strawberries in Pune from Mahableshwar & Panchgani and we are going nuts about it. Stir the mixture until well-blended and smooth. Place the pan over low heat and cook; stirring continuously for about 30 to 45 mins. or till the custard thickens and coats the back of a spoon. Let the contents cool completely. Put the pan in the fridge and chill for about 2 hrs. Wash and drain the strawberries, de-stem and remove any bruised areas. Slice or chop the strawberries roughly. 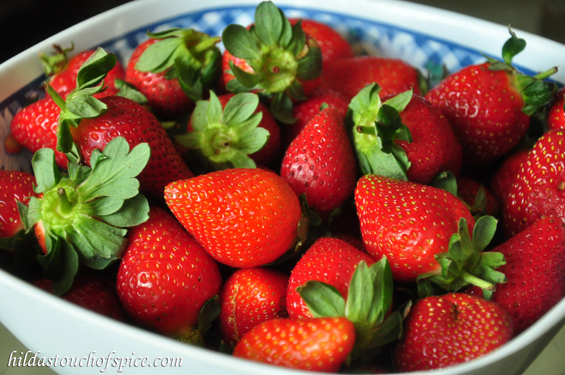 Combine the strawberries with lime juice and ½ cup sugar. Stir gently and allow the strawberries to macerate in the juices for 2 hrs. Cook the strawberries in the microwave for about 2 mins. Combine the cooled custard, heavy cream, vanilla essence & the cooked strawberries. Pour it in a blender and give it a quick run twice or till the strawberries are combined. Keep it a little chunky if you like. Pour this mixture in a container and freeze. Remove from the freezer 15 mins. before serving. 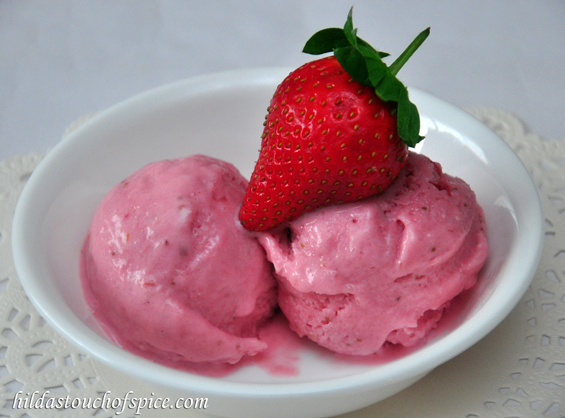 Serve the Fresh Strawberry Ice cream with fresh whole or sliced strawberries.